We all love summer. It’s that time of year when you want to spend your time outside. The sun is out, the birds are singing, the air is fresher, the plants are greener. Everything tells you to go for a bike ride, take that old badminton set for a ride, or go for a jog. But the sun is harsh and it can affect you without knowing it. Put a spin in some of those 8 daily glasses of water a day. I prefer a pinch of salt and a half lemon squeezed in my water. Sodium helps your body absorb water better. It’s perfect after you have solicited your body in the heat. And lemon is perfect always although in excess it can turn on you and your stomach. 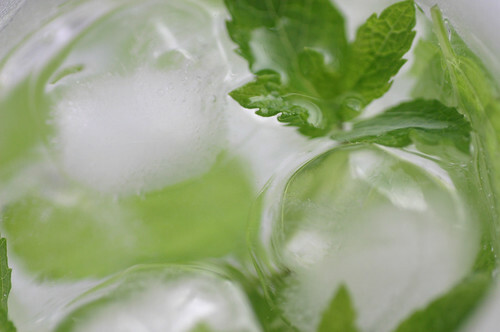 Another favorite of mine is to press a few fresh leaves of mint, that tingling taste satisfies your taste buds. Lately I tried it with basil too, it’s just as fresh. Cucumber is a surprising addition to water, it makes the taste much fuller. Once you try blending water and cucumber together you might never go back. The first time I cracked a coconut I was convinced it was going to be too sweet for me and I would like it. But it’s actually not, you can imagine yourself getting refreshed even in the tropical areas in the hottest days with coconut water. Coconut water has potassium that helps your body rehydrate. It maintains fluid balance in the body. Also, if you just went out jogging it’s a perfect way to prevent muscle cramps. This is for the morning after. But I love to make 4 litres of tea and keep it cool in the fridge. It’s like having my personal soda at home. I love hibiscus tea or mint with a touch of green tea. and you can drink it all day long. We already mentioned almond milk which gives you back protein and is low in calories. With almond milk you can replenish on vitamin E, an excellent antioxidant, magnesium and the good kind of lowering cholesterol fats. But after a workout, the main benefit of almond milk is that you get your energy back. This is an obvious one but worth mentioning it. Most of the times I’m too lazy to squeeze just fruits so I mix fruit and water to get a subtler aroma that hydrates more. So, how do you keep hydrated in these hot summer days?